OnPage has a zero tolerance policy when it comes to undelivered messages and alerts, which is why we added Failover Redundancy to our critical alerting platform. Failover Redundancy is, simply put, a part of our Escalation Policy. What is the OnPage Escalation Policy? An Escalation Policy makes sure that if an incident is not acknowledged or resolved within a pre-determined amount of time, it will be escalated to the correct user(s). You can customize who you want to receive the alert, the amount of time to wait before escalating to the next user(s), and which user(s) the alert should be escalated to. When is an escalation policy useful? Imagine that you have an on-call team, monitoring critical systems. 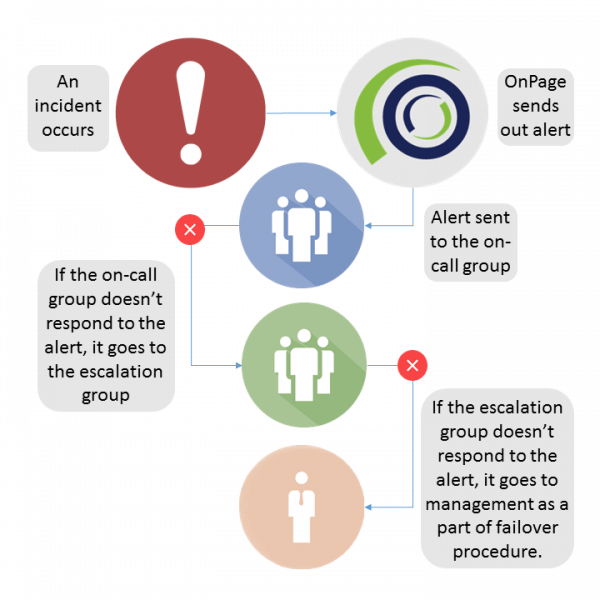 In the event of an incident, an alert is sent out either by a fellow team member or one of the monitoring tools connected to the hundreds of end points being monitored. If this alert is not acknowledged, what happens to it? This is a general scenario in which OnPage is used, especially by our MSP customers. Our Scheduler allows you to schedule on-call teams and allows for precautionary steps to be taken that automate the alert going forth to an escalation team. 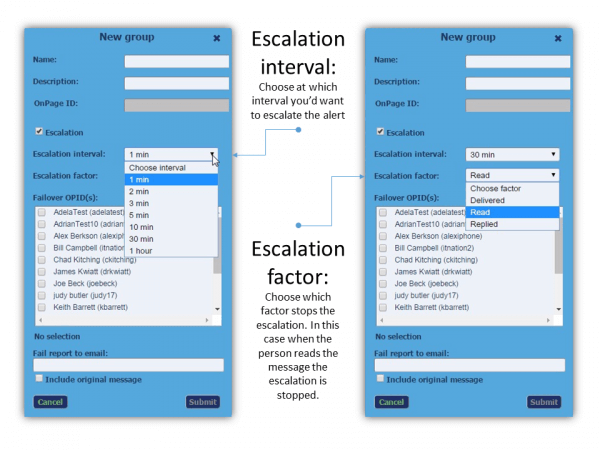 Below you will see how one can set an Escalation Interval and Escalation Factor which determines who gets the alert next. Failover To OnPage ID’s: Inform OnPage users (refer to fig1: “Failover OPID(s):”) of the failed message escalation. Failover recipients are sent a modified copy of the original message which includes “FO:” in the subject and the name of the group the message was sent to. Escalation Failover Report: Specify an email address (refer to fig1: “Fail report to email:”) which will receive a report including the message tracking information for the failed escalation. Including the original message subject and body in the report is optional. The failover makes sure that the right person is notified when the Escalation Policy does not reach an end user. Contact OnPage to learn more .